The English landscape is rich with a huge variety of megalithic constructions, many of which are unique to the British Isles, such as Henges, Recumbent Stone Circles (RSC's), and Cursus, to name a few. It is also home to thousands of standing-stones, stone-circles, 'tumuli', alignments (Around 60 stone rows around Dartmoor alone), long-barrows, dolmen (Quoit's), holy-wells, beacon-hills, ley-lines and sacred/ceremonial landscapes. At around 6,000 BC Britain become an island, separating from the European mainland. Stone Circles (Form and Function). English Sites (Full List and Description). This abundance of megaliths on the English landscape, the traditions, folk-lore and myths weave together to form one of the richest prehistoric tapestries in the world. Henge-structures are now known to have begun being built before stone circles. Their construction would have involved thousands of man hours. (i.e. Stennes in Scotland was estimated at 12,500 man hours alone) (1), as in most cases they were built on levelled areas and included huge ditches and banks reaching several metres in depth and height. In many cases Henges occur in doubles or triples, and astronomical orientations and alignments have been shown suggesting a primary Astro-ritualistic or scientific function. (Silbury Hill, Stonehenge, Avebury, Old Sarum). The location of Silbury hill, (Avebury) on Latitude 51° 24’ 50’’ N is considered by many to be evidence of a deliberate geodetic placement. 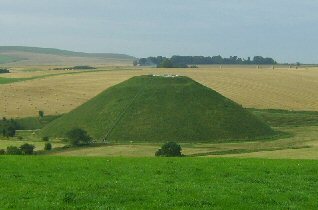 Not only is this latitude of Silbury the same as the exterior of Menkaure's pyramid at Giza, but the latitude of Giza is also the same as the exterior angle of Silbury Hill. (The British Isles contain over 1,000 ancient circles made of stone, wood or soil). Although Stone circles are found in many other countries around the world, their frequency, diversity and sheer size in the British Isles is not repeated anywhere else in the world. 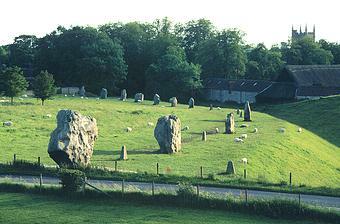 England contains both the largest stone circle in the world at Avebury, and the most expensive at Stonehenge. Although several stone circles are now known to have have had an astronomical relevance, it is not necessarily the case that they all did. It was shown by John Michell, for example, that many English stone circles have a geometric relationship, and a funerary association can be seen in the frequent (often secondary) deposits of human remains found at stone circles across Britain. The megalithic constructions around Thornborough have traditionally been seen as a cluster of disassociated, individual entities, but today we are starting to see them again as part of a larger, connected sacred landscape with the three Thornborough Henges in the centre. This site has been described by English Heritage as 'The most important site between Stonehenge and the Orkneys', and served as a prehistoric ceremonial site from 3,500 BC to 2,500 BC. It can be seen at Thornborough that the three Henges were built over an already existing mile-long Cursus, a fact which supports both the theory that Cursus came before Henges, and that the two different forms may share a similar function (namely the creation of an artificial horizon in an enclosed space). 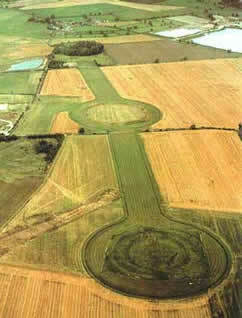 The three Henges mirror 'Orion 's belt', a feature seen at several other ancient sites around the world. Cursus' are one of the earliest forms of major earthworks identified in the British Isles. The Cursus is a prehistoric landscape feature which appears to have been particular to Britain and while most are found in England, there are also a few suspected in Ireland. The scale of construction suggests an organised or even civil level of construction, requiring hundreds, if not thousands of man-hours for each site. 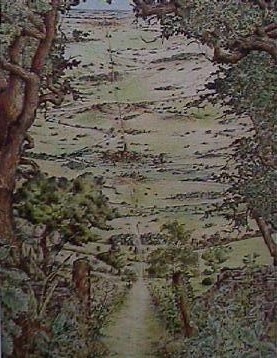 Ley-lines are by no means exclusive to England, but it was one of the first European countries to have recognised the tradition of placing ancient and sacred constructions in alignments, (which were named ley-lines by Alfred Watkins). 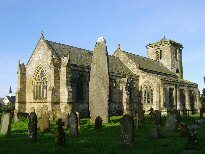 The most famous significant discovery in this field was by John Michell, who identified the St. Michael's Ley - a 'corridor of incidence' running across the country in an alignment that followed the line of the sun on the May-day sunrise. Connecting ancient and sacred sites with straight lines common practice in England for thousands of years. 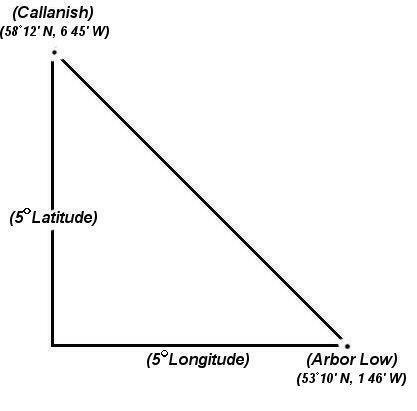 While some have been shown to have a primary astronomical orientation, others are associated with funerary rituals and others appear to have been purely geometric. 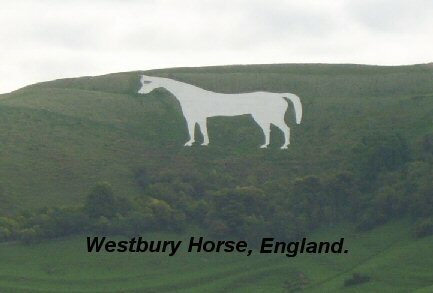 There are/were around 24 white horses in Britain, with the majority of them etched into the chalk cliffs in Wiltshire. While some are only a few hundred years old, the tradition can be shown to go back three thousand years. The Uffingdon White Horse - The oldest white horse in Britain, the figure has been shown to date back some 3,000 years based on optically stimulated luminescence dating carried out following archaeological investigations in 1994 by Oxford university. These studies produced three dates ranging between 1400 and 600 BC. Local tradition claims the Uffington horse to be a representation of the dragon slain by St. George. Article: ScienceDaily (Dec. 15, 2008). A 4,000-year-old amber necklace has been unearthed in England. The rare find was unearthed from a stone-lined grave – known as a Cist - excavated by the team from The University of Manchester Field Archaeology Centre and Mellor Archaeological Trust. 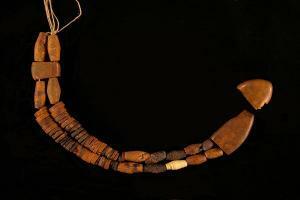 It is the first time a necklace of this kind from the early Bronze Age has been found in north west England. Peter Noble from The University of Manchester said: “An amber necklace of this sort was one of the most important ways that people of the early Bronze Age could display their power and influence. Dozens of different sized pierced amber beads are linked together on a length of fibre to form the beautiful artifact. It was discovered by Vicky Nash from of the Mellor Archaeological Trust. Peter Noble, who directed the dig added: “The necklace was made of amber – which is not found in this region. 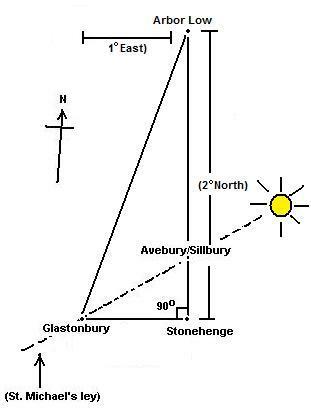 There are now several examples of geometry between some of the most significant prehistoric megaliths in England, apparently connecting the landscape in a way first envisioned by William Stuckeley. The late Prof. Alexander Thom recognised such a geometric fingerprint in megaliths ranging across all of western Europe, but only within the dimensions of the structures themselves, not between structures. Although this subject is largely disregarded by mainstream, it should not be ignored, as discoveries such as the Great Decagon are supported by the earliest scriptures in England. The right-angled triangle formed by Stonehenge, Glastonbury, and Arbor Low(below, left) suggests an origin of this practice originating around 3,000 BC. It is important to note that these divisions are all by units of degrees. Adam's Grave. Long Barrow on the Ridgeway. Arbor Low. Derbyshire, Stone circle, Henge, Cove. Boscawen-un. Cornwall, 19-stone Stone Circle. Cerne Abbas Giant. Dorset, Chalk Cut Giant on Hill-side. Devil's Arrows Alignment of 3 menhirs towards Thornborough. Dorchester Big Rings. Cursus and Henge monument on the St. Michaels leyline. Dorset Cursus Two Cursus end to end 6.5miles long. Dragon Hill Ancient White Horse, Henge, Earthworks. The Hurlers Cornwall, Three Stone Circles. Men-an-Tol Cornwall, Four Stones, One 'Holed'. Remains of Stone circle. The Merry Maidens Cornwall, Stone Circle. Nine Maidens Another name for the Boscawen-Un stone circle. Old Sarum. Important Hillfort, Original location of Salisbury. Rollright's. Oxfordshire. Stone circle, Standing stone, Long-barrow. Rudstone Largest standing stone in Britain. Sanctuary, The Concentric Stone circles, Part of Avebury complex. Silbury Hill Wiltshire, The largest ancient structure in Europe. Stanton Drew Avon, Three Stone Circles, Two avenues and a Cove. Stonehenge Wiltshire, The most expensive Stone-Circle in the World. Thornborough Complex Three Henges, Cursus, Sacred landscape. Trethevy Quoit Large Dolmen near the Hurlers. Waylands Smithy Long Barrow on the Ridgeway. West Kennet Oldest 'Long Barrow' in England. 1). Burl. A. Prehistoric Henges. 1997. Shire publ. 3). C. Knight & R. Lomas. Uriel's Machine. Century. 1999.